Canon announced the Rebel 400D today along with two new lenses (50mm f-1.2 and 70-200mm IS). The new Rebel features a bigger 2.5" LCD, sensor dust management system, and a new CMOS 10.2 MP sensor. 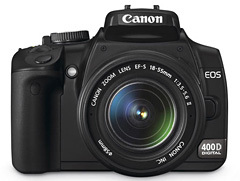 Canon has also lowered the price $100 from the previous Rebel, which means you can get the 400D body for $799 USD. This is a tempting package for those with the original 6MP Rebel, and I bet even current Rebel 350D users will give this new model a close look. The larger LCD and image sensor puts this camera on par with many of Canon's more expensive offerings. Combined with the fact that existing 350D accessories and battery work with the new model, the upgrade path is quite smooth. I remember one of the complaints regarding the original Digital Rebel was that Canon artificially "de-featured" it to a degree so it wouldn't compete with their more expensive DSLRs - there were even firmware hacks to turn some of that lost functionality back on. It'll be interesting to see if that's the case with this new camera. er, make that "400D" - sorry! *sigh* and I just bought the 30d for some of the features that will be in the 400d for cheaper.